Given that the previous topic is now at +80 pages and a bit cumbersome, we believe it is prudent to start a new topic. The most moves you can get approved in advance is 5 simple moves, or 1800 OM worth of variable moves (unless your entire move exceeds that). This is so people don't just dump huge piles of moves to get priced and fixed up, creating lots of work for staff. If you want to get more moves approved, purchase some of the ones you already got approved. Staff may approve extra stuff for you, but have the right to refuse until you purchase moves. 13-Jzall Wrote: Wrote: Powder shot 300 OM, requires ranged proficiency and area attack proficiency: a version of the powder grenade but different enough to be a new move, 13 loads a special pellet into his gun and when it fires it lightly dusts the opponent with the fire dust which is about half the amount of the grenades. The area it reaches is around 1.5 meters squared sideways and 3 meters forward in a cone shape. It is almost impossible to miss if the enemy is close enough and the amount that they are covered by, 1/4 the amount of a powder grenade to 1/2 of a powder grenade, will depend on how far away they are. It is reasonably silent and can normally be used to burn down a wooden wall or door, this will take between 30 seconds and a minute for the door to be weak enough to kick down. It won’t deal any damage but follows the rules for 13’s powder grenade which means that any friction on the dust will cause it to burst into flames. 13 will have to exchange the entire barrel of his gun if he wants to switch the type of bullet between normal and powder which takes 5 seconds. The dust will fall off naturally after about 15 seconds without being set alight, if the dust is on fire then you will have to wait for it to burn out which takes 1 minute and 30 seconds or you can brush it off which is easier if you brush it off as soon as possible. The fire is hot enough to cause burns but the degree of the burn changes with time, at 30 seconds it will cause a 1st degree burn, at 60 a 2nd degree burn and so on. If it's still too strong I'll change timer on the burns to 45 seconds to change the degree. 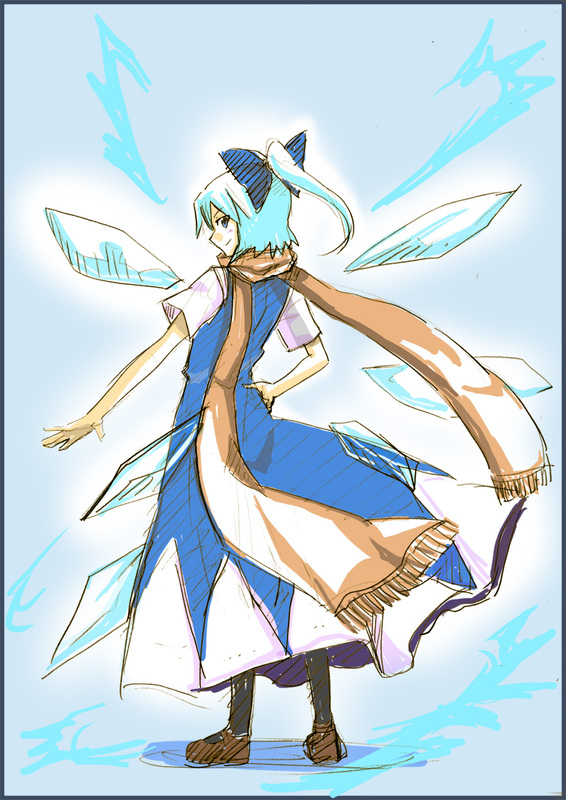 Cirno spends ten seconds at the exhaustion of something akin to stretching (she can not move while making the ice weapon), to create a ten pound, two handed hammer. Hammer head is five inches in diameter and the staff holding the head is 3.5 feet tall and a inch in diameter. She can weld it with ease though to swing it requires both hands so she can't use most of her moves. It is strong enough to shatter a red wood in the red wood forest in two. It can take a beating though she usually drops it after a few attacks, melting quite quickly. The energy usage is roughly that of a person pushing a 100 pound boulder. She calls her hammer Hyōki or ice age. A western long sword from a time when men were knights and the round table was a reality. Cirno creates a five foot long blade in two seconds this is fairly easy on her like stretching though, she can move while making this weapon. It is made of a steel that is freezing to the touch. Her weaker weapon by a large margin. It is used mostly to cut and maim but not destroy. She can move at her top speed and its energy consumption is minor (like doing a fairly easy training exercise) but the accuracy is lower. I hecked up and destroyed the new move approval thread. Oops! Here you go! (09-06-2017, 11:18 PM)Yuuka Kazami Wrote: Changes in bold. tl;dr Increased OM for the knives, nerfed range on scythe (just because it's inconsistent with something else I wrote), and gave a draining drawback. 1 minutes and 30 seconds is too long. Probably 30 seconds sounds more reasonable. And uh, (I can't believe I just noticed this) you need more drawbacks. As this move stands, you could theoretically just continuously spew gallons and gallons of fire all over the everywhere. Ammo count, in-mag and/or total? (As in "I can shoot one canister at a time, then I have to reload, which takes 1.5 seconds. I have three total I can shoot in one fight before I have to recharge it in a non-fight environment.") Balance. I think you should try your next version at the Move Workshop thread. Get more people to help out. Drops it after how many attacks? Melts how quickly? By energy usage, do you mean how much it energy it costs you to swing it? That doesn't sound easy to wield. Small grenades that pack of a punch of ice. Can be thrown by hand or fired from the Cold Gun. Once they actually explode, anything around it can be temporarily frozen (or slowed) depending on the size of it and whether or not it's moving. Either way it's going to hurt. Heidi wields a particularly short and thin double-bladed lightsaber staff. The handle is about 16 inches long and rather thin, compared to the usual double-bladed lightsabers that tend to be closer to 23 inches. Within this lightsaber are two small Lambent crystals, either or both of which may be used by Heidi to produce a pink lightsaber blade two and a half feet long. Eiter or both of these blades can be produced in less than a second. Heidi has two different uses for this weapon. The first use of this weapon is singled bladed. Heidi summons a single pink lightsaber blade 2 and a half feet long. When only one blade is active, Heidi is better able to aim and block and control her own actions in combat. The second use of this weapon is double bladed. Heidi summons two pink lightsaber blades, each two and a half feet long, from either end of her saber. When using both blades, Heidi’s concentration and aim depletes, but her rate of striking increases. In either scenario, Heidi uses an amateurish version of Form VI lightsaber combat, the Ataru or “The Way Of The Hawk Bat”. This is an aggressive, acrobatic style. A practitioner of this form uses high-speed movements, impossible leaps, and deadly strikes. To an outsider, it appears as a wild rush of movement. Heidi’s superhuman natural inclination towards acrobatics and leaping make her a “natural” in the art form, to say the least. She has yet to train more than a few hours. Heidi uses her other moves in combination with her Ataru training. After concentrating for three seconds, Dongja conjures one of the characters above in mid-air. Dongja then selects one target, which then feels a powerful pushing or pulling force (like that of two people pushing or tugging) that, if unopposed, will move the target exactly 25 feet either away or towards Dongja at 5 feet per second. While this movement is happening, Dongja can act as normal. This causes no damage by itself. During the focusing time, the target must be moving slow enough that Dongja can track its exact position visually. The direction is quite exact - for example, if you happen to be above Dongja at the time of casting, you will move vertically upwards 25 feet unless you have some way of stopping yourself. This move can be fairly exhausting. If Dongja uses it multiple times, it will certainly exhaust him. No spells can be cast at the same time as others. This spell is cast instantaneously with no concentration. Dongja conjures the character for teeth above in mid-air. Then his mouth and jaw grows to two times its size, and his teeth turns jagged and sharp. He bites down on a target, doing good damage. But they are still his teeth. Anything that would hurt or otherwise damage teeth will still affect it normally. This move is not very exhausting, but has a cooldown of 13 seconds. As long as no spell is being cast at the same time as this one, this can be cast any time. What is the grenade's area of effect once it has exploded? By "anything around it", do you mean the environment as well as player characters? If you want to include an environmental hazard in your grenade's effects and harm player characters, that will be 600 OM. Then you'll need to specify how long the hazard lasts and what it does to disrupt a foe's attacks. What is the range of this attack? What is the rate of fire? What are the drawbacks? One other thing. When you say temporarily frozen or slowed depending on the size/movement of something... we need specifics. I honestly don't understand what the effects of this could be based on that description. How long would a character be temporarily frozen or slowed? How does the effect of this attack change depending on an opponent's size or movement? Can this move be interrupted? A western long sword from a time when men were knights and the round table was a reality. Cirno creates a five foot long blade in two seconds this is fairly easy on her like stretching though, she can move while making this weapon. It is made of a steel that is freezing to the touch. Her weaker weapon by a large margin. It is used mostly to cut and maim but not destroy. She can move at her top speed and its energy consumption is minor (like doing a fairly easy training exercise) but the accuracy is lower. The damage is like that of a actual medieval sword. Small grenades that pack a punch of ice. If thrown, the range is only as far as Cold's strength will allow, which is maybe 30-ish feet (and it will be very inaccurate the further he throws it). If fired from the Cold Gun, it can be shot about 100 feet effectively, and 200 feet total (with no accuracy). He can only throw or fire one a time. The Cold Gun holds 4 grenades total, and needs to be cocked after each one. Once they actually explode, anything around it in a 10-foot diamater can be temporarily frozen (or slowed) depending on the size of it, whether it's moving and how far away from the center blast it is. Any character that is effected by the grenade can power out of it within 30 seconds. The larger/stronger a character is, or how fast they are moving, will make it less likely they will be completely frozen (and thus just be slowed). Anything environmental will stay frozen over for a few minutes, including the floor. Even if it doesn't specifically freeze someone in the radius, it will still hurt just from the blast impact itself. The grenade is more used for distracting or hampering opponents, so it's not designed to just blow things up. It's more a tool then a weapon, but it still works as one in a pinch. Using her memories of Blue Diamond and her powers, Aquamarine recreates the sad aura that Blue Diamond can create in order to make everyone around her cry and lose focus. It takes half a second for the aura to be created, and once it is created, everyone within a 50 foot radius around Aquamarine will start to cry, though Aquamarine will be immune to the aura since she is the one creating the aura. Not only will the crying cause anyone to lose focus due to having tears in their eyes, but the crying also lowers her opponent's TEC and SPD by 1 each for one round, split between the opponents in radius. The aura will not be able to affect those using a T1 Super Defense, and will not be able to lower someone's SPD to be lower than 0. After concentrating for three seconds, Dongja conjures one of the characters above in mid-air. Dongja then selects one target, which then feels a powerful pushing or pulling force (like that of two people pushing or tugging) that, if unopposed, will move the target exactly 25 feet either away or towards Dongja at 5 feet per second. If the target latches onto something sturdy, lands on a surface that is perpendicular to their movement or tries to skid on a surface of any sort, it will slow their movement or stop them, depending on what kind of actions are taken. If Dongja is struck with a hard enough attack or if he becomes distracted with something else (he can still cast spells, though, as technically the casting for this spell is already over), then the move stops, though their momentum continues to carry them slightly. While this movement is happening, Dongja can act as normal. This causes no damage by itself. During the focusing time, the target must be moving slow enough that Dongja can track its exact position visually. The direction is quite exact - for example, if you happen to be above Dongja at the time of casting, you will move vertically upwards 25 feet unless you have some way of stopping yourself. This move can be fairly exhausting. If Dongja uses it multiple times, it will certainly exhaust him. No spells can be cast at the same time as others. @ Captain Cold: With that Area of Effect, I'm pretty sure you'll need the Area Attack proficiency! A special weapon obtained from the data of Hornet Man.EXE. X can equip this weapon in a flash, shifting his color scheme into a white body with yellow-gold armor, and he cannot use any other special weapon until he reverts to normal. When used, the X-Buster fires a large silvery cone like a spearhead, traveling at the speed of an arrow up to 20 meters accurately before falling out of trajectory. The stinger injects an immobilizing venom into whatever it impacts with, stunning the damaged area for 10 seconds unless it is deflected or instantly removed. X can only fire one shot per second, and can only ever fire 20 stingers without recharging the weapon at a safe base. A special weapon obtained from the data of Plant Man.EXE. X can equip this weapon in a flash, shifting his color scheme into a green body with pink armor, and he cannot use any other special weapon until he reverts to normal. When used, the X-Buster fires a shotgun blast of plant thorns, like deadly flechettes. The blast of thorns can only cover an area 10 meters out in a 1-meter-square area. Charged version fires a shotgun of seeds instead, which explode into a patch of lashing vines 1 second after they hit a surface. X can only fire one shot per 2 seconds, and can only ever fire 14 shots without recharging the weapon at a safe base. (09-11-2017, 08:20 PM)Jade Harley Wrote: @ Captain Cold: With that Area of Effect, I'm pretty sure you'll need the Area Attack proficiency! Okay. I'll buy that too. I went to go purchase it but realized I don't have a log page anymore. Should I re-make it or wait for a higher-up to do it? Is the move good to go aside from the addition of Area Attack Prof? A slit opens up in Kuzuru’s palm and a cylindrical weight attached to a length of chain unspools out. It takes about three seconds for the chain to reach the usable length of five feet. From here it can freely extend and retract up to a maximum length of thirty feet. He can swing the weighted chain around to strike at foes up to thirty feet away, grapple exposed limbs or weapons, and defend against physical attacks by blocking with a length of the chain or smacking a projectile out of the air. Grappling and blocking tend to be more difficult to pull off, especially at farther ranges. While active Kuzuru cannot use his Demon Guillotine move and is only has access to two of his four Demon Blades. Additionally the chain itself, while durable, is not impervious to damage and a sufficiently strong attack can shatter it. It takes about three seconds to completely reel the chain back in, regardless of its current length. Alternatively Kuzuru can focus for five seconds, during which he cannot attack easily. After the five seconds of charge up he can throw his hand out towards a target. Ten weighted chains erupt outwards in a net-like pattern towards a target up to 30 feet. These chains wrap around limbs and anything else they can snare. The chains reel themselves in, assisted by Kuzuru’s own strength. A target can wriggle free using any manner of powers or moves such as malleability or phasing. The chains, while durable, can be broken with a strong enough attack. A strong enough opponent can fight back against Kuzuru’s pull. These chains will last indefinitely, but they are quite tiring to maintain especially against a strong opponent. While active Kuzuru cannot use Demon Guillotine and only has access to one of his four Demon Blades. Once expended Kuzuru must spend five seconds reeling the chains in during which he can move freely, but cannot attack easily. Her personality becomes less cheerful and kind, she is aggressive to a point of protecting herself against heat due to becoming a "Yuki-onna". 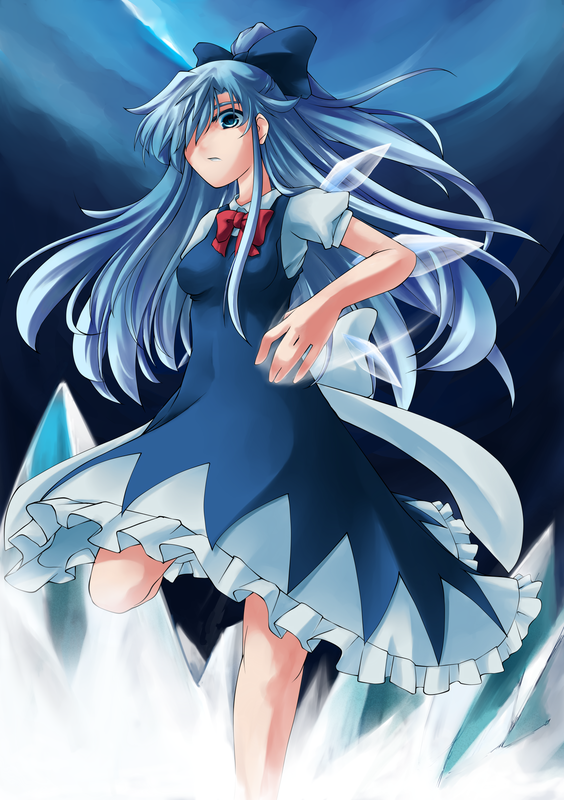 In all actuality she becomes the Youkai of ice age's its just that she is close enough to being a yuki-onna to be placed in there species.